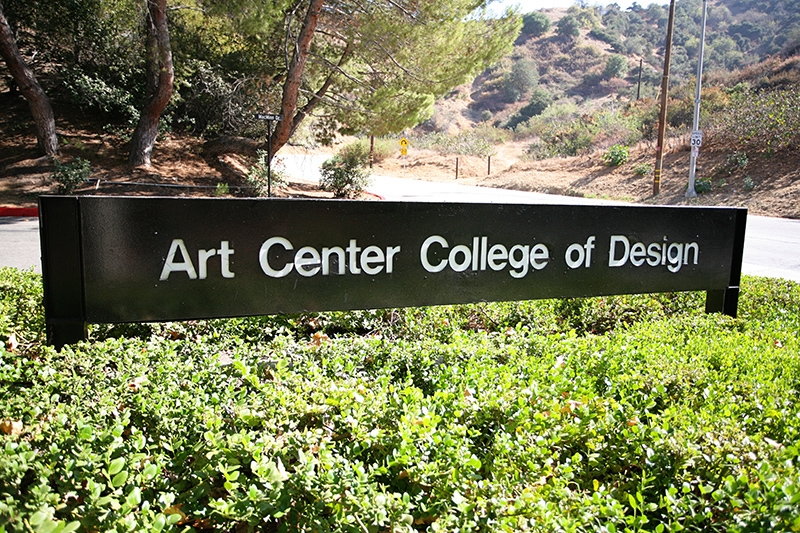 Alvin Lustig, J.J. Abrams, Joe Doucet, and Fred R. Archer are just a handful of notable people who’ve graced the halls of Pasadena’s Art Center College of Design. Founded in 1930, Art Center consistently ranks highly for its undergraduate and graduate programs, which include everything from film to industrial design, to advertising and interaction design. I talked with Joy Liu, an instructor at Art Center from 2013-2014, about where the interactive design industry’s headed, the importance of feedback, and how she prepares students for the real world. What do you teach at Art Center? I co-teach Visual Interactive Design with another instructor who teaches the coding side of things, and I teach design and UX methodology. The class is set up where students pick an app with a user rating of less than 4 stars, and their assignment is to redesign it and do a final presentation during the last week of the course. 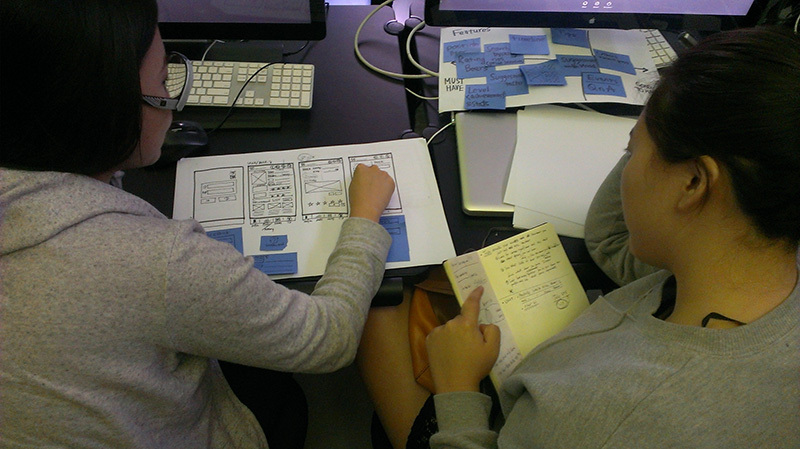 The purpose of the class is to give students a UX tool kit that they can go out and use. It’s not necessarily about building the prettiest interface. What’s your average student’s experience level with design? Most of them are close to graduating, so in terms of a college level, they’re junior to senior. As for industry level, they’re intern to junior designer level. 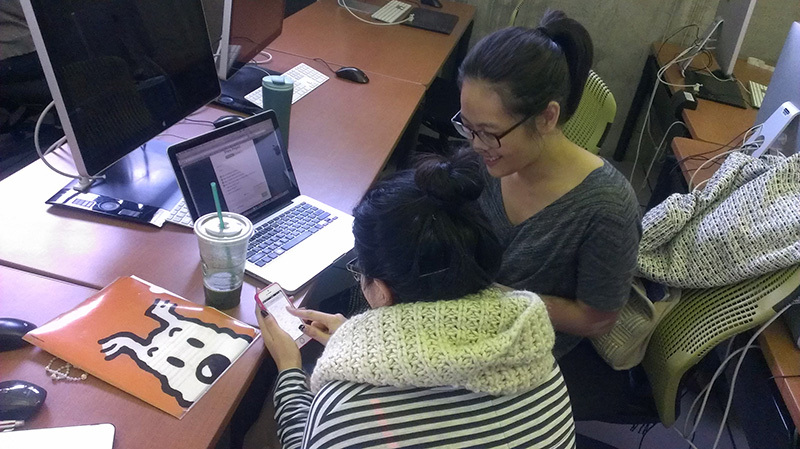 They’ve designed basic websites, but they need more training to design a native mobile application. With graphic design, they’re intermediate to advanced. And they’re around junior designer level with web design. They’ve designed websites, but they need more training before they can design for themselves. What types of challenges do you face in the class? Most students are used to the traditional design process: pixel-perfect, making everything high-fidelity, and never hearing feedback from anyone other than their classmates. They’re not in tune with the real world. I challenge them to test their projects with people outside of school—people who’d actually use what they’re creating. For an assignment like this, they often wind up just asking their classmates and friends. I point out that they’re not designing for the school or college students. They need to get out and really talk to users who are realistic to their project. What’s your approach to providing feedback on student designs? Art Center has a culture of giving and receiving critiques—I went through it when I was a student here. During every class, we all talk about others’ work and provide feedback: what’s working and what isn’t working. For other instructors, they might even invite an alumnus or an industry guest to visit and sit in on a critique. For external feedback, students write out a series of questions and then conduct user interviews before they start an interface design. They’re able to get real, contextual data before they start. Art Center courses are set up on a trimester schedule. Each studio class is 5 hours a week for 14 weeks, with a final presentation taking up the last week. So students only have 13 weeks to finish their project. How do students present their designs? They present twice: the first is a mid-term presentation around week 7 for their research findings and their initial designs, and then there’s a final presentation for their final design and a coded prototype using jQuery mobile. How will you convince me to invest in your product? What is the story you’re trying to convey here? At the end, each student selects 2 products they want to fund, and the score counts as extra credit. So every week, they practice giving an elevator pitch before they present their progress. That pitch gets revised over and over, so when they give their final presentation, they’re able to do a formal pitch. Because they have it down so well, it helps them with job interviews later on when they present this project. At the end of class, I want students to walk out with a better awareness of the audience they’re designing for. If people can understand your concept well with a clickable prototype, then you’re half-way there. Where do you see the design industry going 5 or 10 years from now? Hopefully people will have a better understanding of user experience. The San Francisco tech community has a lot of understanding about it already. In Los Angeles, not so much—they’re still growing and learning. I see UX not just being screen-based, but moving into things like appliances, curved televisions, and wearables. I hope the design community will be more thoughtful about what a good experience should be. And then there’s the Internet of Things. Because of it, I think we’ll get less artificial apps and more meaningful products that have a narrative. What kind of prospects do you see for students as they finish your class? I’ve gotten great feedback about my class—specifically about how it prepares students for an actual job. They go through a professional-level research, design, and workflow process that involves developing information architecture, determining who the user is, and getting usability feedback. They understand why all of this is necessary. I’ve heard from former students that employers are surprised to get this level of work from recent graduates. What skills are most likely to get a student a great job? 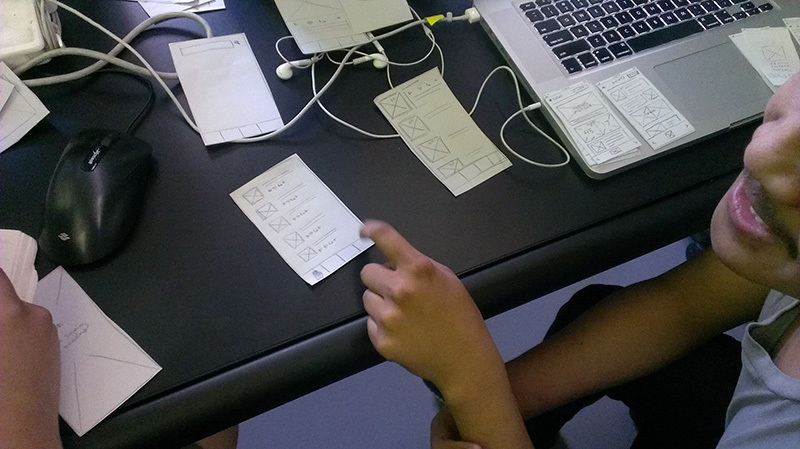 How has InVision helped your students learn design? They learn that you don’t always get it right the first time around. Arriving at a final design takes many iterations—it’s not like designing a poster and clicking “print” means it’s final. We’re lucky to work in the digital space where we have the freedom to improve, adapt, and make a better user experience. Other websites. For example, when I’m working on an ecommerce site, I don’t just check ecommerce sites that are doing well—I’ll look at lists of apps or websites from other genres and see if there are specific interactions that may work for the target audience. I follow a lot of designers on Twitter, and I read articles on Medium. What’s the most exciting part about teaching the designers of tomorrow? 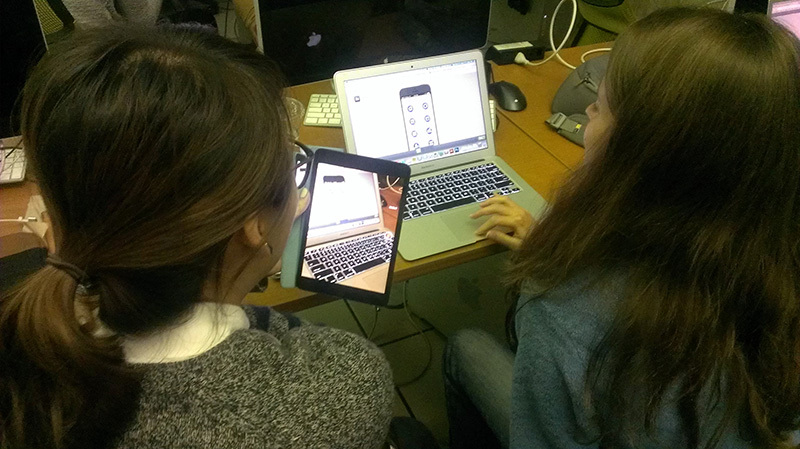 Seeing students realize the importance of user feedback. What tips do you have for those who teach or mentor designers? Use examples. Sometimes they nod their heads and say they understand, but when you show them examples or go through an exercise together you can see where they get stuck. Don’t just trust that students get it when they say they get it . As InVision’s Campus Initiative Coordinator, I work with brilliantly talented students and educators. I love coffee, learning, and my family, not necessarily in that order. Trying to make the world a better place one designer at a time.